McCartney: "Whoever thought we'd end up like androids?" LOS ANGELES, California (CNN) -- They've revolutionized music for nearly five decades. Now, some of the Beatles songs are about to hit video-game consoles. The Beatles are shown in a scene from the new video game "The Beatles: Rock Band." Paul McCartney and Ringo Starr came together Monday at Microsoft's Electronic Entertainment Expo (E3) presentation at the University of Southern California's Galen Center to help promote "The Beatles: Rock Band" video game. E3 is a video-game and entertainment conference in Los Angeles. The two surviving members of the Fab Four walked on stage to "All You Need Is Love" and McCartney even showed-off a little air guitar (or bass) before speaking. "We love the game, it's fantastic," said McCartney. "Whoever thought we'd end up like androids?" Yoko Ono, widow of John Lennon, along with Olivia Harrison and Dhani Harrison -- George Harrison's widow and son, respectively -- also made an appearance in front of the crowd, but did not speak. 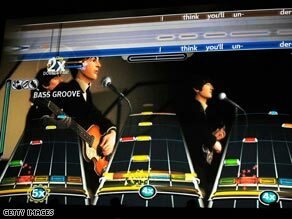 "The Beatles: Rock Band" was developed by Harmonix and published by MTV Games. The interactive title allows gamers to perform as John, Paul, George or Ringo, beginning from their early days in Liverpool through their final gig on a roof top. Gamers will also be taken behind the scenes into the recording studio. "I Saw Her Standing There," "Day Tripper," "I Am The Walrus" and "Back In The U.S.S.R." are just a few of the songs playable in the game, which hits stores September 9. "The Beatles: Rock Band" will be available on Microsoft's Xbox 360, the PlayStation 3 and the Nintendo Wii.